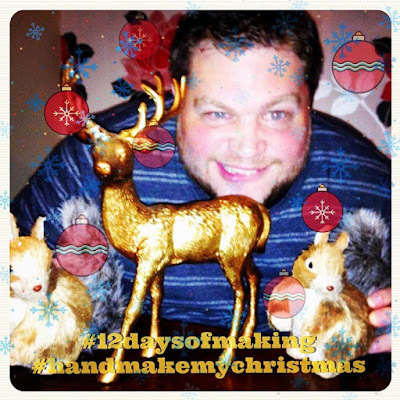 Original Sin Art: 12 Days Of Making, Day Three. Day Three of our Instagram challenged involved the prompt MAKER’S LITTLE HELPER. So, meet Brian, the mischievous elf who also happens to be the love of my life. I couldn’t do anything without all of Brian's love, support, and encouragement. He puts up with me disappearing off to my studio/workshop for hours at a time, and is always ready to take a look at my new creations with a critical eye. He helps me to price my items too, since I really struggle to put a $ amount on my work, despite the effort, materials and hours of labour I put in. Oh, and when I started doing craft fairs this year, he drove me to each place, did all the heavy moving and lifting, watched my stall when I needed a break, helped me set up and take down, and encouraged people to come to see me. I honestly feel like the luckiest girl in the world because I have him to support me.